Popular sport of the mountainous people has become tourist attraction drawing govt support . ISLAMABAD: While others may play other games, the king of games is the game of kings – is an adage associated with polo, considered to be one of the most popular sports of Gilgit-Baltistan (G-B) and Chitral for centuries. Polo has brought together people of these ancient valleys from times when there were no jeeps plying the narrow, precarious roads in the region. Despite the advances of the modern world, this ancient sport continues to bring jubilation and fanfare to the people of the region once in a year at Shandur, Babusar Top and twice in Gilgit, Skardu, Ghizer and Diamer. The word polo – a wooden ball – comes from the Balti language. The game is played in its most ancient and purest form by the mountainous people of G-B and Chitral. Across Gilgit, Skardu, Hunza, Diamer, Ghizer, Shigar, Laspor, Mastoj and all other valleys around have at least one polo ground, where locals people can be seen playing polo. “Freestyle polo is only played in the G-B and Chital in the world, providing an opportunity for joy and entertainment to the locals as well as foreign tourists,” said Gilgit Polo Association President Ashraf Gul. He said the game of kings and the king of games was the shared heritage of G-B and Chitral. The annual tournaments are ritually followed by people living in Shandur, Babuser Top, Gilgit, Skardu, Ghizer and Diamer. “Polo is our traditional game and our recognition in the world. We are fully committed to keeping it intact in the future,” he said. 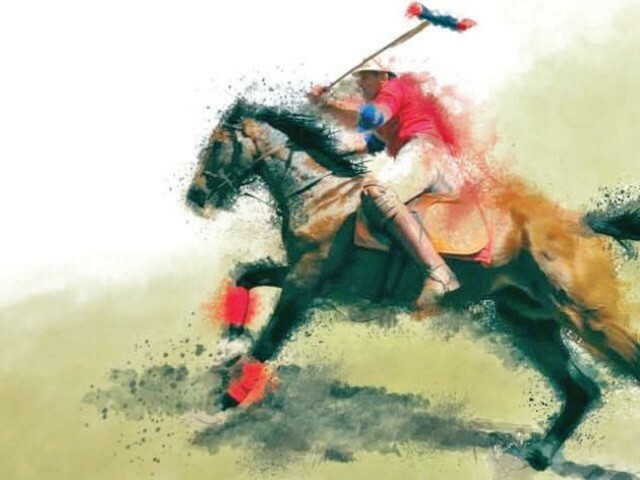 According to Green Society Development Network Baltistan (GSDNB) – a youth-run organisation, polo was played between small kingdoms, villages and rival groups of Gilgit and Chitral. From 1936 onwards polo tournaments were held annually on Shandur ground, the said on its website. The Gilgit and Chitral teams are traditional arch-rivals and their contests draw hundreds of spectators to the Shandur Polo Festival. Before qualifying to play a match in Shandur, players are selected in local venues of Chitral and G-B. It is considered a matter of honour and prestige for any player to get selected to play in Shandur. Therefore, they try their best to impress the selectors making local events more and more interesting. Polo, known as chaugan in Persian emerged from Persia in 600 BC in the Aryan tribes of Central Asia. It reached the present day northern areas of Pakistan with roaming Aryan tribes. Moreover, Abbasid Caliph Haroonur Rashid played the sport in the ninth-century. A tenth-century poet Firdosi has mentioned polo in his famous epic Shahnama. Sultan Qutubuddin Aibak of India died playing polo in 1206 after falling from his horse. Later on, Mughal empires made it a royal pastime and Baber himself was a very good player. The game has evolved with international standards, but in the mountains, it is played in its pristine form. The GSDNB says that the crude form of polo doesn’t look like the organised equestrian sport of British officers and the carriers of their colonial heritage; rather it is a tug of war between the two groups of people wearing different colours of shirts. Amid the thunderous beat of drums and local songs, the game sees horse-to-horse collisions, locked sticks and dangerously falling daredevil players. There are apparently no rules and offences and foul play is abstained on an ethical basis. A legendary polo player of G-B Bulbul Jan said that the dynamics of the sport took a turn when in 1982 Shandur was connected with Chitral and G-B via jeep-able road. With tourists coming to watch the tournament, its popularity increased at national and international level. He reminded that Shandur polo festival was included in the national calendar in the year 1990s, and three days festival was formally scheduled on July every year. Bulbul said people of G-B and Chitral have kept polo alive in its purest form. G-B Sports Director Hussain Ali said the game needs further international publicity for revenue generation. G-B Tourism and Sports Department has been organising polo tournaments every year and is restoring all the polo stadiums in the region. The G-B government has already increased the funds for the polo tournaments in all districts. “We hope that the two governments of G-B and K-P will work together for the successful organisation of this event to keep intact the game of Kings and will play a positive role in the promotion of freestyle polo,” Ali said emphasising on cooperation between G-B and K-P governments. Published in The Express Tribune, June 12th, 2017. Facility said to be the first-ever approved by FINA in country.